BACKGROUND AND PURPOSE: The usefulness of contrast-enhanced 3D T2-FLAIR MR imaging for the evaluation of leptomeningeal diseases has not been systematically investigated. The purpose of this study was to assess the value added by contrast-enhanced 3D T2-FLAIR and MPRAGE sequences to conventional postcontrast T1-weighted images in the evaluation of leptomeningeal diseases. We also undertook in vitro studies in attempts to understand the consequences of our patient study. MATERIALS AND METHODS: Twelve patients with confirmed leptomeningeal diseases underwent postcontrast T1-weighted, MPRAGE, and 3D T2-FLAIR imaging at 3T. Two radiologists independently assessed the presence of additional information on postcontrast 3D MR images compared with postcontrast T1-weighted images. The effect of different Gd concentrations and flow velocities on the signal intensity on 3D T2-FLAIR images was investigated in vitro. RESULTS: According to both reviewers, 3D T2-FLAIR images yielded significantly more information than did MPRAGE images (P < .05 and P < .01, respectively). In the in vitro study, 3D T2-FLAIR was more highly sensitive to low Gd concentrations and less sensitive to high Gd concentrations than were T1-weighted or MPRAGE sequences. On 3D T2-FLAIR sequences, at a flow velocity exceeding 1.0 cm/s, the signal intensity of blood-mimicking fluids at concentrations of 0 and 0.1 mmol/L was as low as at 1.3 mmol/L. CONCLUSIONS: For the depiction of leptomeningeal diseases, postcontrast 3D T2-FLAIR provides more additional information than postcontrast MPRAGE imaging. The superiority of the 3D T2-FLAIR sequence is associated with its high sensitivity to flow. Contrast-enhanced 2D T2-FLAIR imaging is useful for detecting superficial abnormalities as are seen in meningeal disease because unlike T1-weighted images, it does not usually demonstrate contrast-enhanced vessels.1–4 Three-dimensional T2-FLAIR sequences with a nonselective inversion pulse can be acquired in a clinically acceptable scan time by using the variable flip-angle technique in a 3D turbo spin-echo sequence.5–8 As 3D T2-FLAIR imaging yields 3D volume data with isotropic information, thinner section images can be acquired in any plane; this minimizes the partial volume effect between small lesions and surrounding tissue.5,6 Furthermore, 3D T2-FLAIR suppresses CSF flow artifacts.7,8 Although contrast-enhanced 3D T2-FLAIR imaging may be more useful for detecting leptomeningeal lesions, the usefulness of this MR imaging technique in the detection of leptomeningeal lesions has not been systematically investigated. 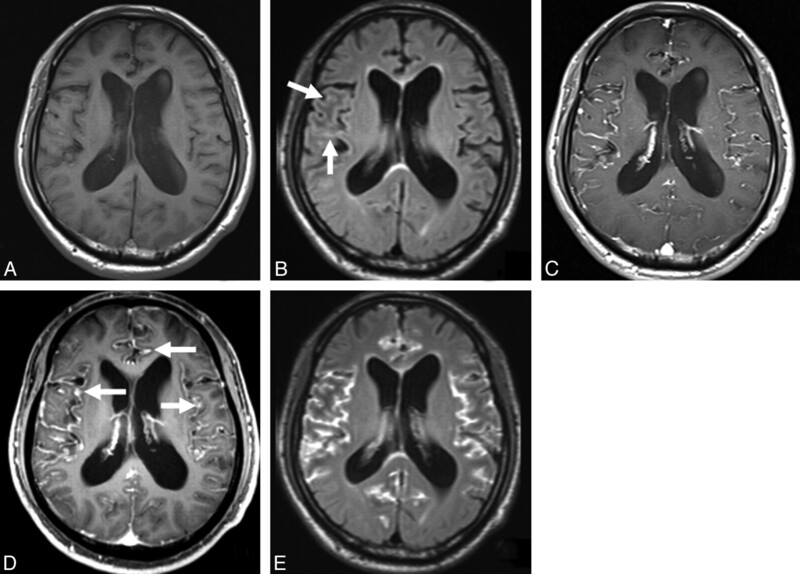 The purpose of this study was to determine the usefulness of contrast-enhanced 3D T2-FLAIR imaging in the depiction of abnormal leptomeningeal enhancement associated with infectious leptomeningitis or leptomeningeal carcinomatosis by assessing the value added by contrast-enhanced 3D T2-FLAIR and MPRAGE sequences to conventional postcontrast T1-weighted spin-echo images. We also undertook in vitro studies by using different Gd concentrations and flow velocities in attempts to understand the consequences of our patient study. Between January 2007 and November 2008, 21 patients with suspected leptomeningeal disease prospectively underwent pre- and postcontrast T1-weighted and 3D T2-FLAIR imaging and postcontrast MPRAGE imaging. Our inclusion criteria were 1) leptomeningeal disease based on clinical examination and biochemical, cytologic, and bacteriologic studies of the CSF; 2) abnormal CSF findings 10 days before to 14 days after MR imaging of the brain; 3) MR images without motion artifacts; 4) no past history of craniotomy; and 5) availability for review of whole series of digital MR data. These criteria were satisfied by 12 patients (10 males, 2 females; age range, 34–85 years; mean, 59.8 years); 8 presented with infectious leptomeningitis or meningoencephalitis and the other 4 with leptomeningeal metastasis. No patients in our study underwent MR examination under anesthetic supervision. The patient characteristics and final diagnoses are shown in Table 1. Prior written informed consent for routine MR imaging studies was obtained from all patients. Our study was approved by the institutional review board of our hospital. All studies were performed with a 3T MR imaging system (Magnetom Trio, A Tim; Siemens, Erlangen, Germany) and a 12-channel head coil. Before contrast material injection, 2D T1-weighted (TR, 600 ms; TE, 8.5 ms; NEX, 1), 2D T2-weighted (TR, 3600 ms; TEeff, 96 ms; NEX, 2; echo-train length, 7), and 3D T2-FLAIR sequences were performed. Two-dimensional T1- and T2-weighted images were acquired with a section thickness of 5 mm. Immediately after the intravenous administration of 0.1 mmol/kg body weight gadopentetate dimeglumine (Magnevist; Bayer-Schering, Berlin, Germany), 2D T1-weighted, 3D T2-FLAIR, and MPRAGE images were obtained. The 3D MR imaging studies were performed by using the following parameters: TR, 6000 ms; TEeff, 420 ms; inversion time, 2000 ms; echo-train length, 142; imaging time, 4 minutes 26 seconds; FOV, 230 × 230 mm; matrix, 256 × 256; and 0.9-mm-thick sections for 3D T2-FLAIR; TR, 1900 ms; TEeff, 4.7 ms; inversion time, 900 ms; imaging time, 4 minutes 18 seconds; FOV, 230 × 230 mm; matrix, 256 × 256; and 0.9-mm-thick sections for MPRAGE. To reduce the imaging time, we obtained sagittal 3D planes covering the entire brain with each pulse sequence. Two radiologists (Y.S., T.O.) blinded to our study hypothesis independently evaluated leptomeningeal enhancement on contrast-enhanced 2D T1-weighted, MPRAGE, and 3D T2-FLAIR images. For each case they assessed whether contrast-enhanced 3D MR (MPRAGE or 3D T2-FLAIR) images yielded additional information compared with contrast-enhanced 2D T1-weighted images. All contrast-enhanced 3D MR images were analyzed in conjunction with the corresponding contrast-enhanced 2D T1-weighted images. Precontrast 2D T1-weighted and 3D T2-FLAIR images were simultaneously reviewed as the reference. All images were assessed on a PACS workstation. For image evaluation of the 3D MR images, sagittal source images and axial and coronal multiplanar reconstruction images were supplied. The presence of additional information on postcontrast 3D MR images compared with postcontrast 2D T1-weighted images was evaluated with a 4-point scoring system where 3 = postcontrast 3D MR images provided additional information about the extent and/or presence of a lesion with definite abnormal leptomeningeal enhancement clearly discriminated from leptomeningeal vessels, 2 = postcontrast 3D MR images provided additional information about the extent and/or presence of a lesion with probable abnormal leptomeningeal enhancement that seemed to be different from leptomeningeal vessels, 1 = postcontrast 3D MR images provided additional information about the extent and/or presence of a lesion with possible abnormal leptomeningeal enhancement that was not discriminated from leptomeningeal vessels, and 0 = postcontrast 3D MR images provided no additional information about abnormal leptomeningeal enhancement. After reading the scans individually, the observers consensually recorded 1) the presence or absence of abnormal intensity in leptomeningeal spaces on precontrast 3D T2-FLAIR images, and 2) the presence or absence of contrast enhancement in the cortical veins on postcontrast MR images. The statistical significance of differences scored on the 4-point scale was determined with the Wilcoxon signed rank test. Differences of P < .05 were considered significant. In an attempt to determine the mechanisms underlying the demonstration of image contrast on postcontrast 3D T2-FLAIR, MPRAGE, and T1-weighted images, plastic tubes filled with solutions of various concentrations of gadopentetate dimeglumine (0.01, 0.05, 0.1, 0.5, 1, 2, and 3 mmol/L) were placed next to the head of a healthy volunteer and imaged with the same 3D T2-FLAIR, MPRAGE, and T1-weighted imaging parameters used in the in vivo study. One neuroradiologist (H.F.) measured the relative SI of the various Gd solutions and the SI of the frontal white matter on 3 imaging sequences. To investigate the effect of flow velocity in the vessels on SI, we carried out a vessel phantom study with various flow rates in a tube. We used a 5-mm-inner diameter tube (Tygon R-3603; Saint-Gobain K.K., Tokyo, Japan) filled with a blood-mimicking fluid (MR imaging fluid model; Shelley, London, Ontario, Canada) (Fig 1). The blood-mimicking fluid has the properties of blood without the problems associated with handling real blood and is suitable for the evaluation of MR imaging techniques. A continuous nonpulsatile flow (velocity 0, 0.1, 0.25, 0.5, 0.75, 1.0, and 1.5 cm/s) was created in the tube with syringe pumps (TE-331; Terumo, Tokyo, Japan) and 3 concentrations of gadopentetate dimeglumine (0, 0.1, and 1.3 mmol/L) in the blood-mimicking fluid were studied. A universal phantom composed of 1000 g of H2O, 1.25 g of NiSO4 · 6H2O, and 5 g of NaCl (Siemens, Erlangen, Germany) was used as the reference; it was scanned simultaneously in conjunction with the tube. One radiologist (H.F.) measured the SI in the tube and in the scanned universal phantom. We calculated the SI relative to the universal phantom at the different flow velocities and with the different Gd solutions. Diagram depicting the experimental setup of our flow velocity study. 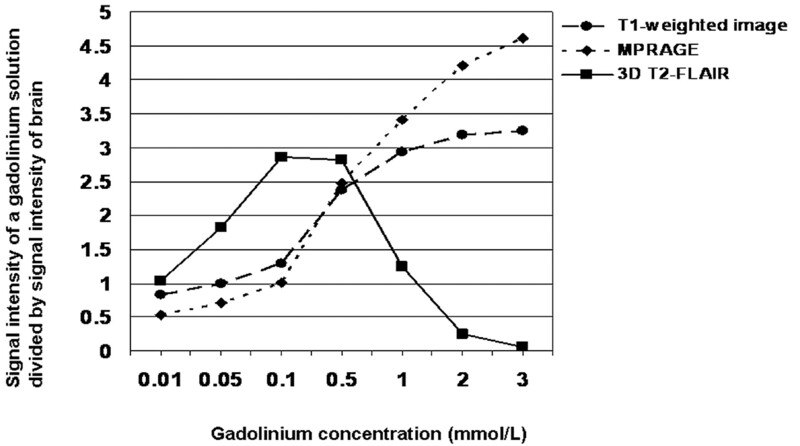 In the in vitro study, a 5-mm-diameter tube filled with a blood-mimicking fluid containing 3 different concentrations of gadopentetate dimeglumine (0, 0.1, and 1.3 mmol/L) was used. A continuous nonpulsatile flow (velocity, 0, 0.1, 0.25, 0.5, 0.75, 1.0, and 1.5 cm/s) was created in the tube with syringe pumps. A universal phantom and the tube were scanned simultaneously. MR images in a 66-year-old man (case 7) with viral meningitis treated with an antiviral agent. A and B, Precontrast T1-weighted (A) and 3D T2-FLAIR (B) images show no apparent leptomeningeal abnormality. C and D, Postcontrast T1-weighted (C) and MPRAGE (D) images depict enhancement in the sulci, corresponding to the vessels. Compared with the postcontrast T1-weighted image (C), the postcontrast MPRAGE image does not provide additional information. Both reviewers ranked the MPRAGE sequence as grade 0. E, Postcontrast 3D T2-FLAIR image shows abnormal leptomeningeal enhancement in the sulci. Compared with the postcontrast T1-weighted image (C), postcontrast 3D T2-FLAIR provided additional information about abnormal leptomeningeal enhancement. Both reviewers scored the 3D T2-FLAIR sequence as grade 3. MR images in a 65-year-old man (case 10) with leptomeningeal metastasis from melanoma. A, Precontrast T1-weighted image shows no apparent leptomeningeal abnormality. B, Precontrast 3D T2-FLAIR image demonstrates slight hyperintense areas in the sulci of the right frontal operculum (arrows). C, Postcontrast T1-weighted image depicts enhancement in the bilateral Sylvian fissures. It is difficult to discriminate between the vessels and the leptomeningeal lesions. D, Compared with the postcontrast T1-weighted image (C), the postcontrast MPRAGE image shows probable thickened enhanced areas in the sulci and Sylvian fissures (arrows). Both reviewers judged that the MPRAGE sequence provided additional information (grade 2). E, Postcontrast 3D T2-FLAIR image reveals markedly enhanced areas in the sulci and Sylvian fissures. As the cortical veins are not enhanced, it is easy to differentiate the vessels from leptomeningeal lesions. Compared with the postcontrast T1-weighted image (C), the postcontrast 3D T2-FLAIR image provides additional information about definite leptomeningeal lesion. Both reviewers scored the 3D T2-FLAIR sequence as grade 3. On precontrast 3D T2-FLAIR images, a slightly high SI area relative to the CSF was seen in the sulci or Sylvian fissure of 3 of 12 patients (cases 2, 3, and 10). No other patients manifested abnormal SI areas in the leptomeninges on precontrast 3D T2-FLAIR images. 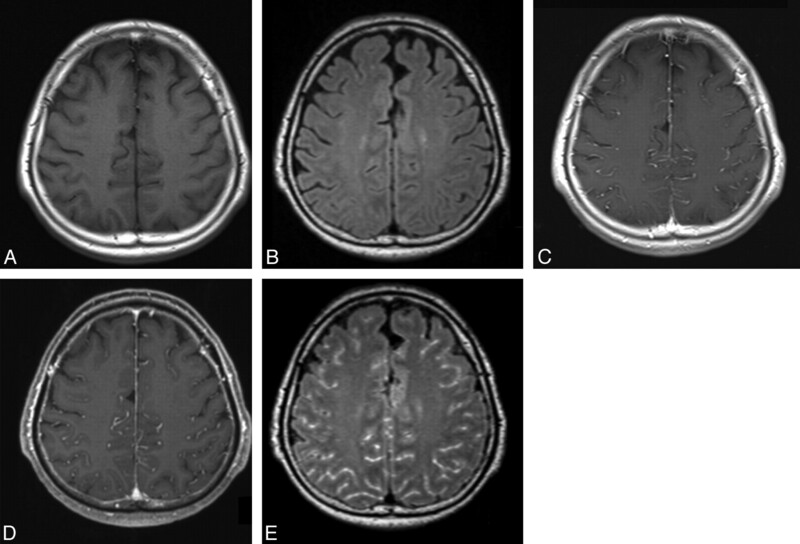 Abnormal leptomeningeal contrast enhancement on postcontrast MR images was observed in 10 patients and not observed in 2 patients (cases 4 and 5, Table 1). Contrast enhancement of the cortical veins was seen on postcontrast MPRAGE and 2D T1-weighted images but not on postcontrast 3D T2-FLAIR images in all patients (Figs 2 and 3). Our results of the semiquantitative comparison of additional information yielded on 3D T2-FLAIR and MPRAGE compared with postcontrast 2D T1-weighted images are summarized in Table 2. Radiologists 1 and 2, respectively, assigned grade 3 in 9 (75%) and in 10 (83%) 3D T2-FLAIR studies and grade 2 (17%) and 1 (8%) in MPRAGE studies. 3D T2-FLAIR images received an overall score of 2.42 ± 1.17 (mean ± SD) (radiologist 1) and 2.50 ± 1.17 (radiologist 2). The assigned scores were significantly higher than for MPRAGE images (P < .05 and P < .01, respectively) (Figs 2 and 3). The SI observed with different Gd concentrations divided by the SI of the brain is shown in Fig 4. In solutions with the lower Gd concentrations (0.01–0.5 mmol/L), the SI ratio was higher on 3D T2-FLAIR than on 2D T1-weighted or MPRAGE images. When the Gd concentration ranged from 0.01 to ∼1.0 mmol/L, the SI ratio on 3D T2-FLAIR images was >1.0 (Fig 4). Comparison of the relative signal intensity of a Gd solution among various pulse sequences. Three-dimensional T2-FLAIR sequences exhibited higher sensitivity to low Gd concentrations and lower sensitivity to high Gd concentrations than did T1-weighted or MPRAGE sequences. 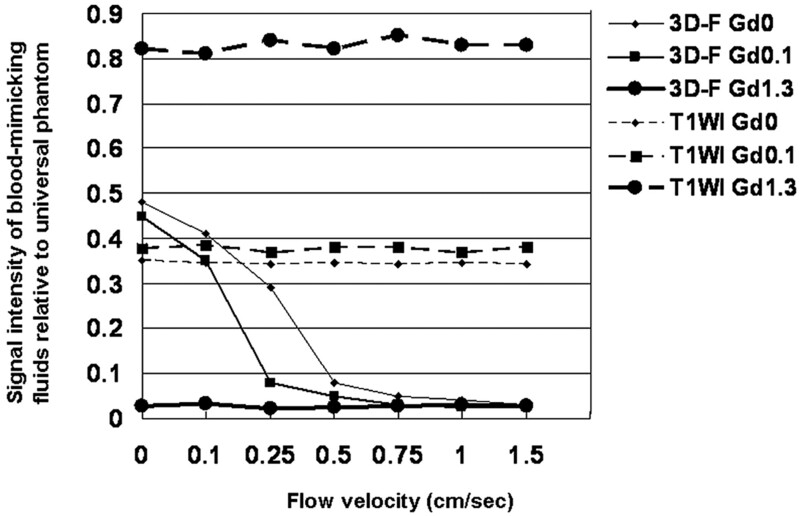 The SI ratio of blood-mimicking fluids relative to a universal phantom at various flow velocities is shown in Fig 5. On 2D T1-weighted sequences, flow velocity did not affect the SI ratio at the 3 Gd concentrations used. In the no-flow status of blood-mimicking fluids at concentrations of 0 and 0.1 mmol/L, the SI ratio was higher for 3D T2-FLAIR than for 2D T1-weighted images. On 3D T2-FLAIR images at a Gd concentration of 1.3 mmol/L, the SI ratio was extremely low regardless of flow velocity; on the other hand, at concentrations of 0 and 0.1 mmol/L, the SI ratio decreased rapidly with increasing velocity. At a flow velocity >1.0 cm/s, the SI ratio of blood-mimicking fluids at the concentrations of 0 and 0.1 mmol/L was as low as at 1.3 mmol/L. Comparison of the signal intensity of blood-mimicking fluids relative to the universal phantom at various flow velocities on T1-weighted and 3D T2-FLAIR images. On T1-weighted images, the SI ratio at the 3 Gd concentrations is almost constant regardless of flow velocity. At no flow of the blood-mimicking fluids at concentrations of 0 and 0.1 mmol/L, the SI ratio is higher on 3D T2-FLAIR than on T1-weighted sequences. On 3D T2-FLAIR images at a Gd concentration of 1.3 mmol/L the SI ratio is extremely low regardless of flow velocity. At the concentrations of 0 and 0.1 mmol/L the SI ratio decreases rapidly with increasing velocity; at a flow velocity >1.0 cm/s, the SI ratio of blood-mimicking fluids at the concentrations of 0 and 0.1 mmol/L is as low as at 1.3 mmol/L. 3D-F Gd0 = 3D T2-FLAIR at 0 mmol/L of gadopentetate dimeglumine (Gd); 3D-F Gd0.1 = 3D T2-FLAIR at 0.1 mmol/L Gd; 3D-F Gd1.3 = 3D T2-FLAIR at 1.3 mmol/L Gd; T1WI Gd0 = T1-weighted imaging at 0 mmol/L Gd; T1WI Gd0.1 = T1-weighted imaging at 0.1 mmol/L Gd; T1WI Gd1.3 = T1-weighted imaging at 1.3 mmol/L of Gd. The results of our study indicated that postcontrast 3D T2-FLAIR imaging adds significantly more information to postcontrast 2D T1-weighted imaging than does postcontrast MPRAGE imaging. Although postcontrast 2D T2-FLAIR imaging was reportedly useful for assessing anomalies in the leptomeningeal space,1–4 concerns regarding its utility have been raised.10,11 CSF pulsation artifacts on 2D T2-FLAIR images may render the detection of lesions in the CSF spaces difficult.10,11 In their study of phantom images, Mathews et al1 demonstrated that at higher Gd concentrations, 2D T2-FLAIR imaging is less sensitive to T1 shortening effects. As is true for 2D T2-FLAIR sequences,1 our first in vitro study showed that 3D T2-FLAIR is more highly sensitive to low Gd concentrations and less sensitive to high Gd concentrations than are T1-weighted or MPRAGE sequences. This phenomenon is thought to be associated with an increase in the T2 effect.12 The expected maximal concentration of Gd in the bloodstream shortly after the 10- to 60-second intravenous injection of a conventional dose of Gd (0.1 mmol/kg body weight) is 2.0 ± 1.2 mmol/L for the aorta and 0.6 ± 0.3 mmol/L for the inferior vena cava.13 The approximate mean concentration of Gd in the inferior vena cava at 60–180 seconds postinjection is 0.4–0.6 mmol/L.13 Although the exact amount of time elapsed between the Gd injection and the beginning of each of the postcontrast sequences varies, our postcontrast 2D T1-weighted sequence, always the first postcontrast sequence, was started ∼60–120 seconds after the injection of Gd. We estimate the Gd concentration in the intracranial vein during postcontrast 2D T1-weighted imaging to be 0.4–0.6 mmol/L. Because the 3D MR images were acquired after obtaining conventional 2D T1-weighted images, we think that the estimated Gd concentration in the intracranial vein of our patients was a little lower than 0.4–0.6 mmol/L. Based on our in vitro results we posit that on 3D T2-FLAIR images, at no flow, the blood that elapsed >120 seconds after injection of a conventional dose of Gd would exhibit high SI relative to the brain. In our in vitro flow velocity study, at a flow velocity >1.0 cm/s, the SI ratio of blood-mimicking fluids at concentrations of 0 and 0.1 mmol/L was as low as at 1.3 mmol/L. This result indicates that 3D T2-FLAIR sequences are extremely sensitive to the flow of blood containing low Gd concentrations. Normal flow velocities at a 95% confidence interval in the dural sinuses and cortical veins are 2–63 cm/s and 2–21 cm/s, respectively.14 We posit that dural sinuses and cortical veins with normal flow exhibit extremely low SI on 3D T2-FLAIR images. In our clinical studies we detected no enhancement in the cortical veins on 3D T2-FLAIR images. This finding supports the presence of a flow-related signal loss effect in this 3D T2-FLAIR sequence. Contrast enhancement in the central nervous system is the result of a combination of 2 primary processes: intravascular (vascular) and interstitial (extravascular) enhancement.15–17 In the leptomeningeal region, contrast leakage from vessels into the CSF is another process underlying enhancement.18–20 In various pathologic conditions, the permeability of meningeal vessels increases with the breakdown of the blood-brain, blood-CSF, or blood-nerve barrier.18–20 As 3D T2-FLAIR sequences are thought not to show signals in the leptomeningeal vasculatures at normal flow, leptomeningeal enhancement on postcontrast 3D T2-FLAIR images may indicate true leptomeningeal enhancement. This would facilitate the clear differentiation between pial or arachnoid vascular enhancement and extravascular interstitial or CSF enhancement on 3D T2-FLAIR images. In addition to this effect in the vasculatures, the effective suppression of CSF artifacts on 3D T2-FLAIR images7,8 may have contributed to the better conspicuity on 3D T2-FLAIR sequences. There are some limitations in this study. First, our study population consisted of a small number of patients with leptomeningeal lesions. Because our results were promising regardless of the small number of subjects, further clinical studies with large population should be performed. Second, the time-dependence of Gd enhancement may have affected our results. The first postcontrast sequence was always the conventional 2D T1-weighted sequence. Because all 3D sequences were obtained later, we may have overestimated the added value of both 3D sequences. Third, partial volume effects may have affected our assessment of the images. To decrease the influence of this effect, we used the same 0.9-mm isovoxel images in our assessment of 3D T2-FLAIR and MPRAGE images, and we posit that partial volume effects did not significantly affect our findings. Fourth, we did not include precontrast MPRAGE images in this study because the acquisition time of the 3D MR images was relatively long. Therefore, to assess contrast enhancement, we used precontrast T1-weighted images as the reference for postcontrast MPRAGE- and T1-weighted images. Fifth, we did not evaluate the effect of high flow on SI in our in vitro study. Slow flow often shows a high SI on T1-weighted images due to the inflow effect. Therefore, we focused on slow flow in the vasculatures in our experimental study. As 3D T2-FLAIR sequences have very long TE, the inflow effect would not appear on this sequence. In our patient study, postcontrast 3D T2-FLAIR imaging added significantly more information to conventional postcontrast 2D T1-weighted images with respect to abnormal leptomeningeal enhancement than did postcontrast MPRAGE imaging. In our in vitro study, 3D T2-FLAIR proved to be more highly sensitive to low Gd concentrations and less sensitive to high Gd concentrations than were 2D T1-weighted or MPRAGE sequences. Based on our flow velocity study, we suggest that leptomeningeal vasculatures with normal flow exhibit extremely low SI on postcontrast 3D T2-FLAIR images due to their high sensitivity to flow. Leptomeningeal enhancement on postcontrast 3D T2-FLAIR images may represent true leptomeningeal enhancement. We are grateful to Mika Kitajima, Shinichiro Nishimura, and Koya Iwashita for their collaboration in the clinical study, and to Yasuhiro Hiai for help with the in vitro studies. Accepted after revision September 26, 2009. Can leptomeningeal enhancement be linked to multiple sclerosis?